It is estimated that approximately 200,000 Canadians are currently diagnosed with Crohn’s Disease. Those afflicted with the condition carry a lifelong risk of flare-ups that can result in extreme discomfort. Know the signs of Crohn’s disease for your own health and the health of your loved ones. Crohn’s disease is a condition that causes inflammation throughout an individual’s gastrointestinal (GI) tract causing severe discomfort, weight loss, and a variety of other symptoms. Though the inflammation can strike anywhere along the GI tract, it is usually found in the lower small bowel area or upper end of the colon. Patches of inflammation may be intermingled between healthy areas of the gut, and these may breach the intestinal layers from the inner lining to the outer lining. 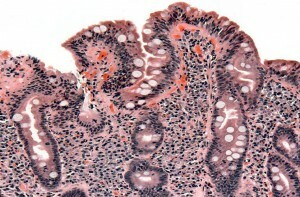 The precise cause of Crohn’s disease is not fully known, but experts believe there is a connection to the autoimmune system. Diagnosis is generally performed using X-rays and a colonoscopy to explore the inner walls of the intestine. Blood and stool samples are also used to eliminate other disease possibilities. Most cases are diagnosed before age 30—Though Crohn’s can affect people in any age group, symptoms generally present themselves early in life. The cause is unclear—Although professionals understand much about the human body, they do not yet fully understand the cause of Crohn’s disease, but believe it is linked to autoimmune dysfunction. Family disease—Because of the link to autoimmune disease, which can be passed down by parents, Crohn’s disease tends to affect families. About one-quarter of sufferers have family members who are also affected. Crohn’s disease affects the body in multiple ways, but is most commonly known for stomach and bowel irritation. Though it is a lifelong condition, symptoms often come and go, and a person can experience months without flare-ups. Crohn’s Disease Support Network—A free, non-profit network created in 2009, with the goal of helping individuals, families, and friends who support those with Crohn’s disease. The Crohn’s and Colitis Foundation of Canada (CCFC)—In 2008, the CCFC released an important report titled “The Burden of Inflammatory Bowel Disease in Canada,” which shed new light on the disease. If you or a loved one is suffering from symptoms of Crohn’s disease, make sure you see a physician right away for diagnosis and proper care. Support groups and organizations are available to provide support, and if your symptoms are severe enough, you may even qualify for a disability tax credit. If you have children who suffer from Crohn’s disease, please read our Child Disability Benefit Guide to find out if you qualify.